Big shout out to all the Mueslims out there. Yo, sufis! 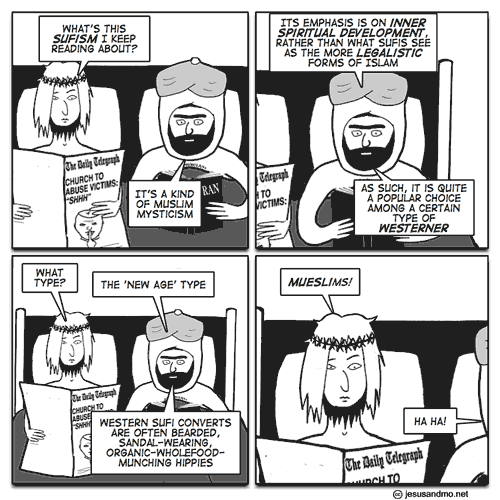 APOLOGY: It has never been my intention as the author of Jesus & Mo to hurt the feelings of anyone, or to single out any group of people for attack. I now understand that this strip could be construed as doing both of those things. 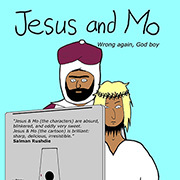 For this reason, I would like to apologise for any offence this cartoon may have caused to the muesli-eating community. Hey, there’s nothing irrational about muesli. It can cure cancer and increase your IQ. If there is a hell, then its very definition is the feeling of having an irresistible urge to cough while eating Muesli. Does their radical wing have Suficide bombers? I love it, the cartoon – oh, all right, and Müsli. Jesus’ nose and mouth are too baby-ish. The former crooked up stuff were better. 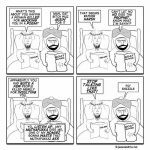 Oh and I ate Muesli this morning – does that make me a Mueslim? One of the best strips yet! @ Mr Gronk. They often snack on Wahabi peas. Ohhh, Sufis. The BUDDHIST muslims…..
Yo, ishkarioth. A big shout to all you guys from a practicing sufi. Second, I do like muesli. With a spoonful of orange jam on top. So you might be onto something. So what’s the deal with the guy on Jesus’ mag cover? Is the top of his head cut off? WTF???? Ohhh and yes apology was quite funny!!!!! It would have helped a little to use an Umlaut: “MÜELSIms” (the “Müesli” spelling is regional, but it is used on packaging on occasion). @ “Müsli” is a possible spelling as well, and it would look nice in the joke. I think that’s Ratty in his little hat which has his little tail. @ FedupwithR – Yep me thinks you are right. Not being a catholic I didn’t catch on. Not to bright either!!! @Kliby & soof – thanks for the suggestion. I tried adding an umlaut, but it didn’t look right. I don’t think it’s really English with an umlaut – none of my dictionaries list it, anyway. Love it. Puns are great. Pedantic hat on: Adding an ‘e’ after the vowel is a way to spell German words when you don’t have a keyboard or character set capable of producing the glyph representing the vowel with the umlaut. e.g. the word schön can be represented as schoen and müsli as muesli. Since there’s no umlaut in written English (not to be confused with the diaeresis), the word muesli should be spelled as the author has. I ate “Alpen Original Muesli Cereal” today. I wonder what that makes me…other than regular. I love Muesli alot :). Especially with strawberry yoghurt or vanilla or natural yoghurt. But what does Muslim has to do with muesli?!? LOL~way too funny!! I love this strip !!! i love this cartoon, and i share it with my friends on my home page on facebook. La ilaha and that’s all. There’s two famous British pop singers became Muslims. One supported the fatwa against Salman Rushdie, the other is a Sufi. Which is why Richard Thompson > Yusuf Islam. Anthony G. Your pedantic hat didn’t fit too well, Muesli is not a German word, it’s a Swiss one. Damn, I hate typos. He never said it was a German word. Sigh. OK, it’s time for some pedantic typography. In German, the word is spelled “Müsli”, or “Muesli” when the diacritical Umlaut/diaeresis/trema is not available. English uses the latter spelling, because English dictionaries are rather allergic to foreign characters. The spelling “Müesli” is the Swiss form. For the joke, I would have liked the “Ü”, but think including the “E” is more important, because the change in spelling needs to be visibly apparent: the two dots are too subtle to do the job on their own. So, I’m thinking that with the hippy hair, the beard and the sandals, Cheesus is a Sufi now, too? This strip should become a cereal. Author, you’re right in part. Sufism comes in two strains (though there may be many subcategories). One lot, let’s say, “fringe Sufis”, characterised at the extreme by such movements as Universal Sufism, has the eastern, syncretist flavour you mention. It’s “eh, Islam/ish/” without being Islam/ic/. The more mainstream type of Sufism is thought, certainly by its adherents, to date back right to the first Ummah, and it is charaterised by perhaps some philosophical thought/ideas, but essentially a combination of strict adherence to the Islamic laws with a deep, and outwardly expressed, love of the Prophet and, to a lesser extent, certain prominent figures in Islam. This love is expressed through devotional music and chanting. There are also shades of grey, as you sometimes get “Sufis” apparently of the latter variety (as they may be identifiably Islamic in some practices), who may hold themselves above requirements, for example, to pray or to abstain from alcohol by virtue of their self-proclaimed spiritual greatness and closeness to God.